This post has 2,429 views. 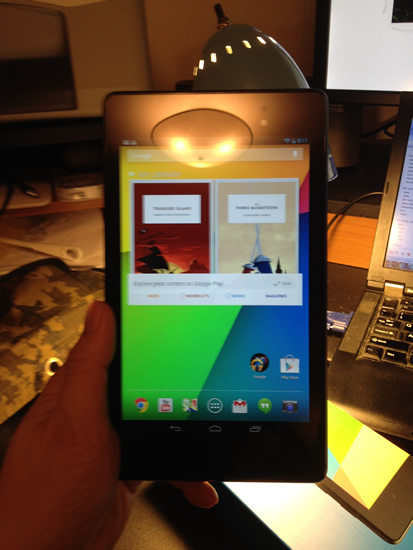 The last piece of electronics that I’m bringing home for the holidays is a Google Nexus 7 16GB (2013). My parents have a first-gen iPad, but it’s a little old and doesn’t work quite right these days, so they asked me to pick up a tablet during Thanksgiving/Black Friday. 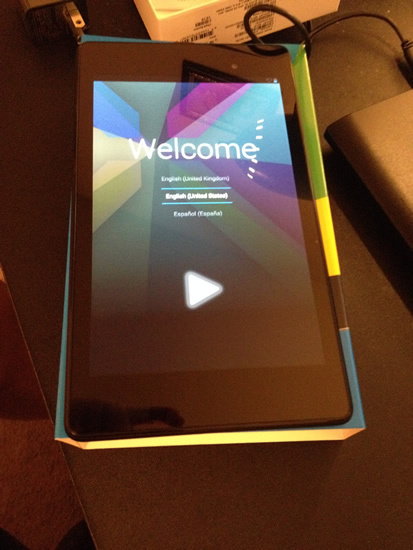 Since I didn’t want to battle the crowds to get one of those discounted iPad Minis, I bought a Nexus 7 instead. The discounts are’t as heavy as the ones of the iPads, but the Nexus 7 ends up being cheaper anyways because it has a much lower MSRP. Combined with the fact that the 2013 Nexus 7 has newer and better hardware than the first gen iPad Mini (the retina iPad Mini is a little out of our price range), the choice wasn’t hard. Ultimately the Nexus 7 will stay home with my parents, but of course I had to give it a little test drive, and here are my impressions of the tablet. There are a lot of choices when it comes to buying Android Tablets, and they range from the really cheap ones for $70 to high end iPad-competitors that cost over $400. At the around $200 dollar range there are lot of choices. Ultimately, I chose the Google Nexus 7 because it’s Google’s version which means it has a “vanilla” version of the Android OS. The Nexus 7 also has some pretty nice hardware for the price, with a 1080p 7 inch screen, quad core processor, 2GB of RAM etc.. It also helps that the reviews for the Nexus 7 (2013) are mostly very positive. 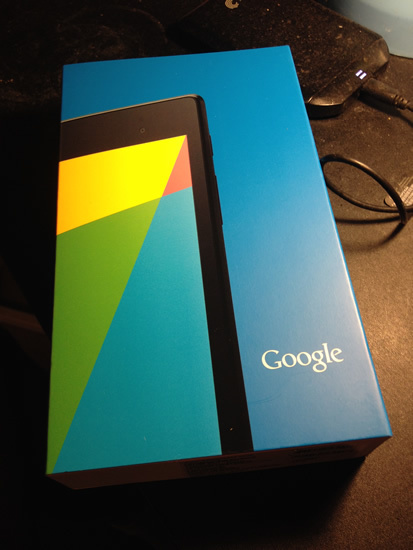 The 2013 Nexus 7 arrive in a nice blue box with the Google logo and a photo of part of the Nexus 7 on the top. The outer blue cover slides off to reveal the white box that contains all of the goodies. 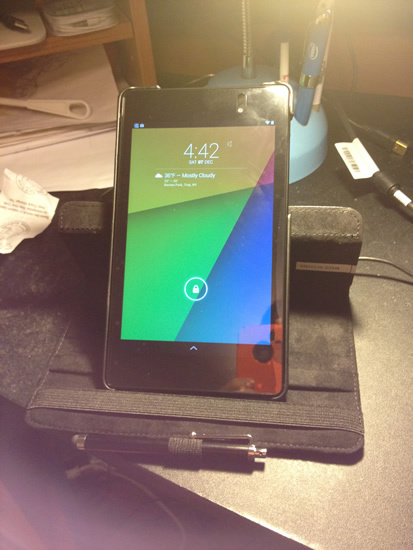 The Nexus 7 itself is on the top, and underneath is the micro-USB cable, the charger, and some information pamphlets. The packaging is very high quality, which is to be expected as Google is trying to compete with Apple’s products while undercutting the purchase price. Opening the box reveals the black slate we are looking for. Like the 2012 version, the 2013 Nexus 7 is manufactured by Asus, and the Asus logo is found on the back of the tablet and on the charger. The whole tablet is colored black. The back is plastic and has more of a matte finish compared to the very reflective front side. The micro-USB connector is on the center of the bottom side; a microphone jack is on the top side, and the power/lock and volume buttons are on the upper right. The Nexus 7 is looks pretty sleek, and has an excellent feel in my hand. The 7-inch size makes it easy to hold the tablet with just one hand. Of course, you still have to use the other hand to touch the screen. 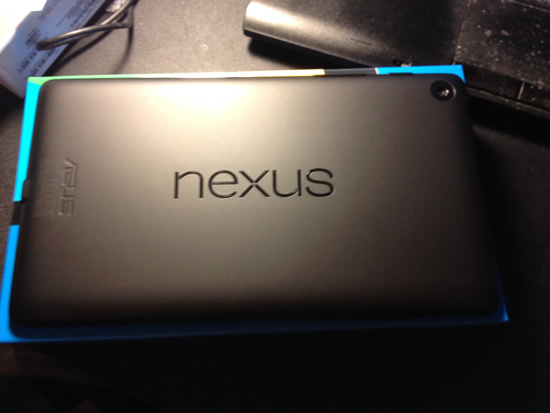 The back of the Nexus 7. Powering on the Nexus 7 brings to life to its vibrant 1920x1080px screen. The screen looks great, and text and graphics are very sharp. Compared to the old first-gen iPad that my parents had, the difference is night and day. Setting up the Nexus 7 involved creating or logging in with a Google Account and didn’t take too long. I haven’t used an Android device before, but it’s similar enough to iOS that it didn’t take me long to figure things out. The mechanics of using these touch screen OSes are not all that different. The Nexus 7 came with Android 4.3, but since this is the Google version of Android, Android 4.4 is already available for the device and I quickly installed 4.4. Other Android devices will have to wait longer until their manufacturers provide their versions of the update. So far, I’ve used the Nexus 7 to play some games, and also watched some movies that I loaded into the storage. 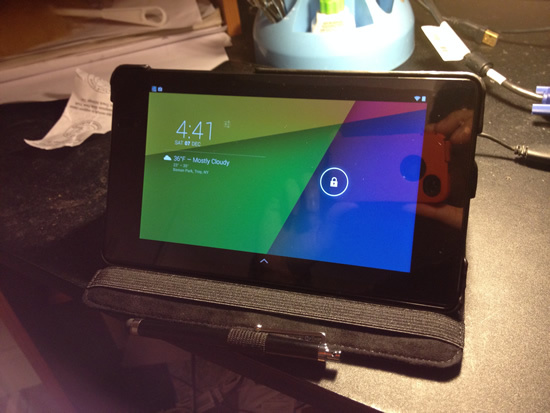 The Nexus 7 is generally pretty responsive, and had no problems handling these tasks. I had some problems with games freezing, but that might due to the games themselves rather than the device. Battery life seems to be quite good. I watched two movies on a flight for a total of about 3 hrs, and the battery still had about 75%. Playing games seems to drain the battery a bit faster. I also tried to use Skype with the Nexus 7. The Nexus 7 has a 1.2 megapixel, fixed focus front camera and a 8 megapixel auto-focus rear camera for taking pictures. I haven’t tried taking a photo with the tablet, but the front camera delivers very good video quality. The quality seems to be much better than my laptop’s webcam, but of course my laptop is 3.5 years old at this point. 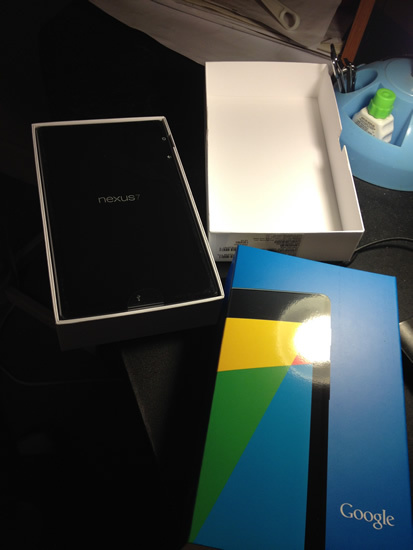 My first impressions of the Google Nexus 7 (2013) has been very positive. The device is well-made both in hardware and software, and I think my parents will like it. The only complaint I have is the position of the power and volume buttons, as they are too close together. Sometimes I try to turn up the volume and touch the power/lock button instead. I think the power button should be in a different place, like on the top side. Having the option of the a microSD storage expansion would be nice too, although 16GB should be okay if you delete the apps you don’t need. 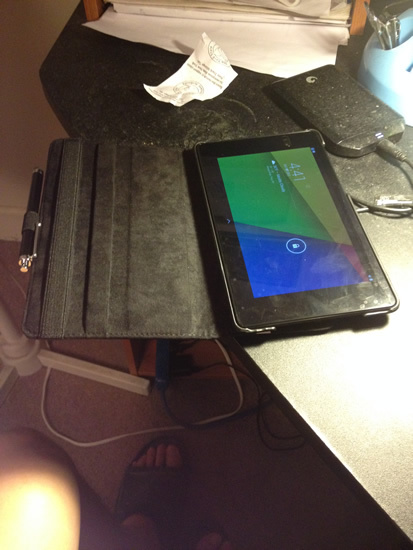 To go along with the Nexus 7, I purchased a nifty little leather case for the tablet. 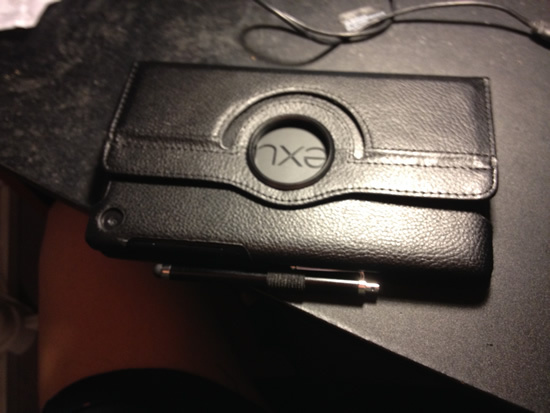 The case can allow the Nexus 7 to stand up both in portrait and landscape orientations, and it came with a capacitive stylus.